Introduction: The aspiration for light skin (fair complexion) is becoming pronounced in a greater number of people in the present times with natural products being more in demand than their synthetic counterparts. Research in the area of skin-lightening agents is an expanding field with the knowledge being updated regularly. In Ayurveda, varṇya, raktaprasādana, tvacya are few terms specifying skin lightening with respect to its modern counterpart i.e., Tyrosinase inhibition, the most commonly reported method of skin lightening. Aim: The present review is undertaken for screening twenty herbs from Varṇya Mahākaṣāya, Lodhrādi varṇya gaṇa, Elādi varṇa prasādana gaṇa and few varṇya formulations to evaluate their probable modes of action through which the skin lightening is effected as per both Ayurveda and biomedical concepts. Materials and Methods: Critical review of herbs to show varṇya property is compiled from various Ayurvedic texts as well as from multiple articles on the internet to justify their skin lightening property on the basis of data collected. Result and Conclusion: All the twenty herbs reviewed are found to act as varṇya directly (citation as varṇya) or indirectly (alleviation of pitta and rakta) as per Ayurveda and to interfere in melanogenesis pathway through tyrosinase inhibition as per biomedicine. This shows their potential to act as good skin whitening agents. Śuṇṭhi being a part of many varṇya formulations, is the only herb among all reviewed in the present study found to exhibit tyrosinase inhibition without any Ayurvedic citation of varṇya property. The contemporary concept of wellness includes beauty, health, fitness as well as anti-aging aspects. Beauty, specially fairness of skin, is a subject of socio-medical importance and has given rise to many skin-lightening procedures such as dermabrasion, ultrasound, and laser therapy.,,,,, Unhealthy skin gives rise to social issues whereas healthy-intact skin increases cheerfulness and confidence. Traditional herbal medicines provide an interesting source for development of new skin-care cosmetics. Indian Cosmetic market is growing at 15-20% annually, twice as fast as two leading countries i.e. US and EU market. The unique, effective, and long lasting concept of beauty in Ayurveda has led to the emergence of Ayur-cosmaceuticals. The concept of varṇa, chāyā, prabhā dealt in Ayurveda are innate entities of beauty. The word varṇa in Sanskrit means "outward appearance, exterior form, figure, shape, colour", "colour of the face", "good colour or complexion, lustre, beauty.Varṇa is not just colour but it includes all the parameters of healthy and radiant skin.Chāyā is the entity which circumscribes varṇa and prabhā is the highlighter of complexion. Thus whatever brings softness and beauty to skin along with enhancement of complexion, radiance or luminescence is termed as varṇya. In Ayurveda, process of formation of skin in foetus is attributed to pāka of rakta dhātu. Agni mahābhūta is said to be at the root of varṇa utpatti (skin colour formation) and pitta being the main seat of agni is responsible for the same.Prabhā or maintenance of body complexion is one of the functions of pitta and bhrājaka pitta seated in the skin radiates the glow of one's natural complexion that is expressed through varṇa. Hence the herbs which alleviate pitta, rakta in general either acting through their rasa, vipāka or prabhāva are considered as varṇya. There are two main types of melanin that determine skin tone viz. Eumelanin and Phaeomelanin. Individuals with darker skin tones have mostly eumelanin as compared to phaeomelanin and vice-versa. Various physiological processes determine pigmentation in the human body, few of which are controlled genetically viz. development and density of melanocytes, expression of the enzymatic and structural constituents of melanosomes while others viz. synthesis and distribution of melanin in skin, transport of melanosomes to dendrites and keratinocytes are the targets for manipulation through skin-lightening agents. Skin-lightening agents interfere in the melanogenesis pathway, melanin transfer or desquamation for lowering pigmentation on the surface of the skin, which generally acts by any of the ways such as Tyrosinase inhibition, Mitf (microphthalmia-associated transcription factor) inhibition, Down regulation of MC1R (Melanocortin receptor 1 which is a Gs-protein - coupled-receptor) activity, Interference with melanosome maturation and transfer and Melanocyte loss (exfoliation). Apart from Tyrosinase inhibitors, Anti-oxidants and Vitamins such as A, B, C, E either directly or indirectly serve as skin lightening ingredients. Tyrosinase inhibition is the most widely reported screening method in the literature for skin-lightening ingredients. Tyrosinase (monophenol monooxygenase), also known as polyphenol oxidase (PPO) is a copper-containing enzyme present in melanocytes that catalyzes two major reactions during melanogenesis, including hydroxylation of tyrosine and oxidation of the o-diphenyl product, L-DOPA which produces a highly reactive intermediate that is further oxidized to form melanin by free radical-coupling pathway. Some of the best known tyrosinase inhibitors are hydroquinone  and kojic acid  which interact with copper at the active site of the enzyme tyrosinase, thus decreasing its activity. Antioxidants serve to reduce oxidation of tyrosine to DOPA quinine  as well as the quenching of free radical help in reducing the synthesis of melanin, thereby contributing to skin de-pigmentation effects. Vitamins have been known to improve skin tone as well as texture. Vitamin A has been used for some decades for the treatment of melasma. Tretinoin acts as a skin-lightening agent by inducing exfoliation and accelerates the loss of epidermal melanin by increasing the turnover rate and by promoting the proliferation of keratinocytes., Retinyl palmitate, a derivative of retinoic acid is also used in skin-lightening cosmetic preparations. Among the various classes of Vitamin B, two have been identified to have skin-lightening activity: (a) Vitamin B3 (Niacinamide): Is a well known antioxidant and interferes in melanasome transfer from melanocytes to keratinocytes leading to skin lightening. (b) Vitamin B5 (Panthenoic acid): A derivative of vitamin B5, calcium pantetheine sulfonate has been observed to interfere with the glycosylation of tyrosinase, thereby leading to depigmentation effects. Vitamin C deactivates UV-induced free radicals and also acts as a tyrosinase inhibitor, thereby lightening the skin. Vitamin E acts as antioxidant in the body and provides protection against UV-induced hyperpigmentation. It is of great interest to know that cosmetically used traditional formulations have activities that might be useful in modern formulations. Modern trials have also established the utility of Indian herbs both as curative and cosmetic as per traditionally documented applications. Ayurvedic literature describes over 200 herbs and minerals to maintain and enhance the beauty of the skin. 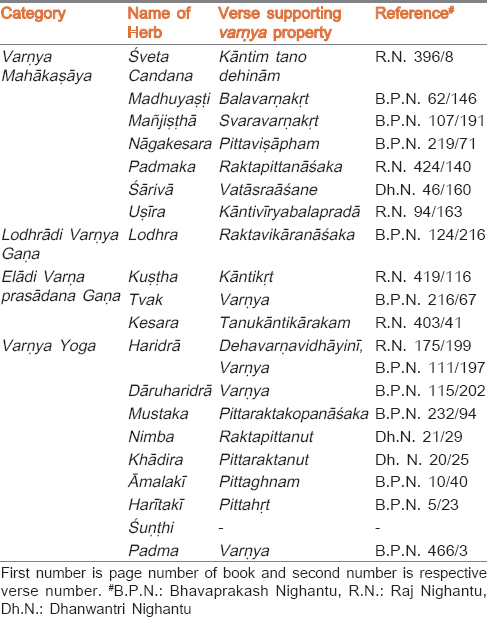 A few herbs evaluated for skin whitening effect from varṇya mahākaṣāya, lodhrādi varṇya gaṇa, elādi varṇa prasādana gaṇa and a few varṇya formulations viz. haridrā khaṇḍa, nimbādi cūrṇa, candanādi taila, kuṅkumādi taila,  kanakāriṣṭa The herbs and their action are described below. Being considered as a symbol of vitality, it is commonly used as a cosmetic and in skin care. It is suitable for all types of skin. Sandalwood oil being rich in sesquiterpenoid alcohols (80-90%), is mainly used in numerous skin fairness enhancing cosmetics and had shown low acute oral and dermal toxicity in lab animals. Recent studies have indicated that α-santalol, the major constituent of the sandalwood oil, is a potent inhibitor of tyrosinase (IC50 = 171 μg/mL) as compared to kojic acid and arbutin (IC50 – 149 ug/ml) showing great potential for use in skin-care. Liquorice root offers skin depigmenting, lightening, emollient, anti-acne, photo protection, antiaging, antimicrobial and antioxidant properties, all helpful for a healthy skin. Role of G. glabra on skin is mainly attributed to its antioxidant activity of phytochemicals namely triterpene, saponins (Glycyrrhizin-salts of glycyrrhizic acid) and flavonoids. Glycyrrhizetic acid controls the secretion of melanin in skin and it has the effect of reducing dark pigmentation and making the complexion fairer. Methanolic extract of its rhizome has been reported to be a potent tyrosinase inhibitor in human skin with more than 75% inhibition. The IC50 value was found to be within range when compared to well known skin whitening agent i.e. Kojic acid. Therefore, it is likely to be useful for cosmetic applications. It holds the reputation of a very good skin care herb as is used to make the complexion even and lighten dark spots. Ayurvedic texts enumerate its qualities to be: Varṇya, rakta prasādaka, rakta śodhaka (blood purifier). Chemically, it contains glucosides known as Manjisthin and Purpurine, along with resins, lime salts and colouring agents. Methanolic extract of this herb has been reported to show 14.80% mean inhibition of tyrosinase activity thereby acting as skin whitening agent. Although it is not popular as a skin care herb but the scientific screening of this plant has confirmed its antioxidant, blood purifier effect along with its potential use in cosmetics. Phytochemically, phenyl coumarins, xanthones, triterpenoids, flavanoids are mainly held responsible for its biological activity. A study has revealed its potent antioxidant activity comparable to that of standard ascorbic acid. In another study solvent extract of Š chestnut flowers (chestnut tree being the english name of Nāagkesara) has shown to exhibit remarkable mushroom tyrosinase inhibitiory activity as effectively as arbutin and protection against ultraviolet (UV) rays making it a strong candidate for use in cosmetics. The use of Padmaka as skin care herb is well documented in both Ayurveda (Used in leprosy, leucodermaa, erysipelas) and in biomedicine, even then it is not a popular cosmetic herb. Recently, a new flavanone glycoside Puddumin-B, (naringenin-42-methyl-ether -7-O-β-D-galactoside) has been isolated from Prunus cerasoides which exhibited anti melanogenesis activity by suppression of tyrosinase protein making it a suitable candidate for skin whitening. Commonly known as Anantamūla or Salsa, it is employed as a blood purifier and for various skin problems. It promotes health and energy and cures diseases caused by vitiated blood. The antioxidant activity of methanolic extract of H. indicus root bark has been evaluated in several in vitro and ex vivo models. Methanolic extract of its root has been reported to show 14.80% mean tyrosinase inhibitiory activity when assayed using l-DOPA as the substrate. Another study revealed root extracts of H. indicus to contain 2-hydroxy-4-methoxybenzaldehyde as principal fragrant phenolic compound showing inhibitory potential against diphenolase and monophenolase activity of the tyrosinase enzyme thus proving its skin whitening potential. It is an ecofriendly, perennial tussock grass that is used traditionally for various ailments but the commercially extracted Vetiver zizanoides essential oil (VZ-EO) has extensive applications in cosmetic industries. Over 150 compounds have been isolated from vetiver oil so far, the most abundant component being cedr-8-en-13-ol (12.4%) along with α-amorphene (7.80%), β-vatirenene (5.94%), α-gurjunene (5.91%) and dehydro-aromadendrene (5.45%). It has been reported that VZ-EO exhibits significant antioxidant activity and suppresses the β-MSH-induced melanogenesis thereby decreasing melanin production through tyrosinase inactivation and the simultaneous suppression of oxidative stress in B16 melanoma cells. Therefore, VZ-EO has the potential to become an ingredient in future hypopigmentation cosmetics. This herb is credited with cleansing and soothing properties, and hence is used in various skin ailments. Salireposides isolated from its extract has well documented activity against acne producing bacteria. It has also been reported to show 6.60% mean tyrosinase inhibitory activity, and thus is useful as a mild skin care herb. Roots of this plant are indicated in various skin disorders such as leprosy, erysipelas, as well as to improve complexion. In Modern research also, methanolic extract of crude drug exhibited approx. 33.4% tyrosinase inhibition when assayed with slightly modified dopachrome method showing its usefulness as a skin whitening agent. All the three varieties of Cinnamomum viz- zeylanicum (Dālcīni), tamāla (Tejpatra), cassia have been shown to have skin whitening property. C. cassia - Essential oil is chemically composed of cis-2-methoxycinnamic acid (43.06%) and cinnamaldehyde (42.37%) along with trans-cinnamaldehyde (33.95%–76.4%). It has been reported that the activity of mushroom tyrosinase as well as melanin production in B16 melanoma cells were significantly inhibited by Cinnamomum cassia essential oil as well as cinnamaldehyde, Therefore, C. cassia essential oil can potentially be employed as an effective skin-whitening agent. -C. tamāla- C. tamāla also has proven potential to be used in herbal cosmetics for improving skin complexion as its alcoholic extract showed 25.0 ± 0.30% mean inhibition of tyrosinase activity. Commonly known as saffron, it is a well-known complexion promoter as per the texts of Ayurveda. Two clinical trials had established anti-pruritic and complexion promotion effects of saffron. It has been reported to contain more than 150 carotenoid compounds including safranal, zeaxanthin, lycopene and various α- and β-carotenes  along with a rich source of riboflavin. The methanolic extracts of Crocus sativus flower has shown increased tyrosinase inhibitory activity with increasing concentration, i.e., from 10.78 at concentration of 50 µg/ml to 28.22 at 1000 µg/mL  along with having antioxidant activity due to presence of cyanidins. In another study, kaempferol isolated from the petals of Crocus sativus has been found to inhibit the oxidation of L-3,4-dihydroxyphenylalanine (L-DOPA) catalyzed by mushroom tyrosinase with an IC50 value of 67 µg/mL thus exhibiting skin whitening potential. Commonly called turmeric, the rhizomes of this herb exhibit properties such as photo protection, anti wrinkle, anti ageing, antioxidant, astringent, anti-irritant, moisturizing effects which are all good for the skin. Curcumin or diferuloylmethane and other curcuminoids constitute the main phytochemicals of Curcuma longa. Curcumin's utility in cosmetic ailments is increasing by the day as it has been proven that topical administration directly delivers curcumin to the affected tissue. Curcumin has been found to suppress melanogenesis in stimulated melanoma cells through down regulation of melanogenesis-related proteins such as tyrosinase and tyrosinase-related proteins. A recent study on turmeric rhizomes has proven maximum efficacy of 88.56% inhibition of tyrosinase activity supporting the above cited use of haridrā as skin whitening agent. This plant is traditionally documented as skin complexion promoter similar to haridrā. A number of alkaloids have been found in dāruharidrā viz. bereberine, oxycanthine, palmatine, epiberberine, karachine, dehydrocaroline, taximaline etc, with the major constituent being berberine having a yield of 2.34%. Antioxidant potential of 50% aqueous ethanolic root extract of dāruharidrā is well documented. Methanolic extract of this herb has shown 20.80% mean tyrosinase inhibitory activity. Both the facts support its varṇya property. It is not a commonly used herb for skin disorders but as it is well documented in Ayurveda for treating blood disorders, and therefore indirectly it helps in maintenance of healthy skin. The phytochemical investigations of C. rotundus rhizomes had revealed the presence of polyphenol, flavonol glycoside, saponin, Vitamin C, sesquiterpenoids  and essential oil. In a study, methanolic extract of this herb has been found to have 11.82% tyrosinase inhibitory activity.Cyperus rotundus rhizomes extract has been proved to be a potential source of natural antioxidant, both the above cited facts suggest its utility in future for skin whitening cosmetics. Perceived as a beauty aid in India, neem is particularly prescribed for skin diseases and detoxification of blood. The use of nimba as skin whitening agent is not so popular although purified neem oil and powdered leaves are a major component of at least one widely used facial cream and other cosmetics. But recent studies have suggested its utility as skin whitening agent because the methanolic extract of neem bark has shown significant tyrosinase inhibition activity up to 43.59% whereas leaf showed 10.10% activity. Also, the hydro distilled extract of its heart wood has been reported with significant anti-oxidant activity owing to presence of high phenolic content. Khādira is considered as the best herb beneficial to the skin in Ayurvedic texts  and is highly valuable for its powerful astringent and antioxidant properties due to the presence of catechins. Its methanolic extract has shown remarkable i.e. 44.40% tyrosinase inhibitory activity as compared to aqueous extract exhibiting only 12.78% inhibition. This goes to show its skin lightening property. Indian Gooseberry or Āmlā is a well known antioxidant used to treat and heal a number of health ailments. It has been reported that antioxidant strength of āmlā is derived from its high density of ellagitannins  such as emblicanin A (37%), emblicanin B (33%), punigluconin (12%) and pedunculagin (14%) rather than due to high amounts of ascorbic acid (vitamin C). Although it is not popular as skin whitening herb but it is a component of various varṇya formulations in Ayurveda being a potent anti-oxidant which has been explored scientifically. A Study conducted to evaluate tyrosinase inhibitory activity of ethanolic and methanolic extract of āmlā has shown IC50 value of 247.37 ± 18.57 and 193.75 ± 44.90 respectively as they inhibit mRNA expressions of tyrosinase and its related proteins, proving its efficacy as a skin whitening agent. It is mainly recognised as a wonder medicine for digestive problems along with being a part of many skin whitening formulations in Ayurveda. Nine phenolic compounds, including two phenolic carboxylic acids, seven hydrolyzable tannins, eight triterpenoids had been isolated from it. Methanolic aqueous extract of the gall of Terminalia chebula has been found to have potent inhibitory activities against melanogenesis (39.3-66.3% melanin content) in B16 melanoma cells induced by α-melanocyte-stimulating hormone (α-MSH). Isoterchebulin had reduced the protein levels of MITF (microphtalmia-associated transcription factor), tyrosinase and its related proteins. So, it can be a useful skin whitening agent for future cosmetics. Ginger is commonly used and posseses many health benefits. 6-Gingerol has been found to be an active component of ginger whose effects on mushroom tyrosinase and melanin content were determined spectrophotometrically and the expression of tyrosinase and related proteins in B16F10 murine melanoma cells was evaluated by Western blotting. A Study had reported that 6-gingerol (25-100 µM) effectively suppresses murine tyrosinase activity and decreases the amount of melanin as well as intracellular reactive oxygen species (ROS) level in a dose-dependent manner acting as a good whitening agent for skin. Often used as an example of divine beauty and elegance, its flowers, seeds, young leaves and roots (rhizomes) are all edible. The flavonol miquelianin (Quercetin 3-O-glucuronide), as well as the alkaloids coclaurine and norcoclaurine, has been found in the leaves of N. nucifera and its seeds contain alkaloids, saponins, carbohydrates and phenolics. Hydro alcoholic extract of its seeds has been reported to show significant antioxidant nature in various in vitro and in vivo models  and methanolic extract of seed showed remarkable 33.57% tyrosinase inhibitory activity, showing potential to be a good skin whitening agent. Due to revival of preference for natural products and for fair as well as flawless skin, skin whitening herbal cosmetics are in big demand across the world. Skin lightening is not only a psychological and social issue, but also related to general health issue that needs to be addressed with some interventions. As tyrosinase inhibition is still the most sought after mechanism of skin lightening, herbs having such property will show promise as depigmenting agents. In Ayurveda, pitta and rakta vitiation are held responsible for impairment of skin health, lustre, colour as well as complexion and skin diseases such as visarpa (erysipelas), vyaṅga (melasma), śvitra (leucoderma), dadru (urticaria), pippalu (moles) to name a few, therefore herbs alleviating these two will act as skin lightening agents. Most of the herbs evaluated above for their action upon skin whitening are largely described as varṇya drugs in Ayurveda. A few among them act indirectly as varṇya by alleviating rakta and pitta doṣa as shown by the respective verses in the [Table 1]. Interestingly it is found that śuṇṭhi, although a part of many varṇya formulations is the only one that is not cited for varṇya property directly or indirectly in Ayurveda but is still found to have tyrosinase inhibitory activity. To the best of our knowledge, this review is thefirst attempt to compile and correlate the probable mode of action of varṇya herbs describing both Ayurvedic and biomedical points of view. Drugs evaluated here are described with varṇya use in Ayurveda but are being used primarily for ailments rather than as skin applications. We found all the herbs evaluated here to act as varṇya directly or indirectly as per Ayurveda and to inhibit tyrosinase enzyme activity. Hence they can be potentially employed as effective skin-whitening agents as well as for treating hyper pigmentation disorders in future cosmetic formulations. There are a multitude of single herbs viz. Bakuci, Vaṭa aṅkura, Aśoka, Vidārī, Vāsa, Devdāru to name a few and polyherbal or herbo-mineral preparations that have been attributed with Varṇya property in Ayurvedic lexicons whose Tyrosinase inhibition studies should be undertaken so as to explore their potential as skin whitening agents. Datta HS, Paramesh R. Trends in aging and skin care: Ayurvedic concepts. J Ayurveda Integr Med 2010;1:110-3. Gupta AK, Gover MD, Nouri K, Taylor S. The treatment of melasma: A review of clinical trials. J Am Acad Dermatol 2006;55:1048-65. Berardesca E, Ardigò M, Berardesca M, Cameli N. Melasma: Current and future treatments. Expert Rev Dermatol 2008;3:187-93. Reszko AE, Berson D, Lupo MP. Cosmeceuticals: Practical applications. Dermatol Clin 2009;27:401-16, v.
Kono T, Groff WF, Sakurai H, Takeuchi M, Yamaki T, Soejima K, et al. Comparison study of intense pulsed light versus a long-pulse pulsed dye laser in the treatment of facial skin rejuvenation. Ann Plast Surg 2007;59:479-83. Hakozaki T, Takiwaki H, Miyamoto K, Sato Y, Arase S. Ultrasound enhanced skin-lightening effect of vitamin C and niacinamide. Skin Res Technol 2006;12:105-13. Green BA, Yu RJ, Van Scott EJ. Clinical and cosmeceutical uses of hydroxyacids. Clin Dermatol 2009;27:495-501. Halliwell B, Aeschbach R, Löliger J, Aruoma OI. The characterization of antioxidants. Food Chem Toxicol 1995;33:601-17. Monier M, Williams A. Sanskrit English Dictionary. Reprint. Delhi: Motilal Banarasidars Publishers; 2005. p. 924. Trikamji AY. Charaka Samhita. 5th ed. Varanasi: Chaukhamba Sanskrit Samsthan; 2001. p. 353. Trikamji AY. Charaka Samhita. 5th ed. Varanasi: Chaukhamba Sanskrit Samsthan; 2001. p. 365. Trikamji AY. Sushruta Samhita. 8th ed. Varanasi: Chaukhamba Orientalia; 2005. p. 348. Boissy RE, Nordlund JJ. Biology of melanocytes. In: Arndt KA, LeBoit PE, Robinson JK, Wintroub BU, editors. Cutaneous Medicine and Surgery. Philadelphia: W.B. Saunders Co.; 1996. p. 1203-18. Nordlund JJ, Boissy RE, Hearing VJ, King RA, Ortonne JP, editors. The Pigmentary System: Physiology and Pathophysiology. New York: Oxford University Press; 1998. p. 1198. Thody AJ, Higgins EM, Wakamatsu K, Ito S, Burchill SA, Marks JM. Pheomelanin as well as Eumelanin is present in human epidermis. J Invest Dermatol 1991;97:340-4. Yamaguchi Y, Brenner M, Hearing VJ. The regulation of skin pigmentation. J Biol Chem 2007;282:27557-61. Petit L, Piérard GE. Skin-lightening products revisited. Int J Cosmet Sci 2003;25:169-81. Parvez S, Kang M, Chung HS, Cho C, Hong MC, Shin MK, et al. Survey and mechanism of skin depigmenting and lightening agents. Phytother Res 2006;20:921-34. Kamakshi R. Fairness via formulations: A review of cosmetic skin-lightening ingredients. J Cosmet Sci 2012;63:43-54. Perluigi M, De Marco F, Foppoli C, Coccia R, Blarzino C, Marcante ML, et al. Tyrosinase protects human melanocytes from ROS-generating compounds. Biochem Biophys Res Commun 2003;305:250-6. Verallo-Rowell VM, Verallo V, Graupe K, Lopez-Villafuerte L, Garcia-Lopez M. Double-blind comparison of azelaic acid and hydroquinone in the treatment of melasma. Acta Derm Venereol Suppl (Stockh) 1989;143:58-61. Cabanes J, Chazarra S, Garcia-Carmona F. Kojic acid, a cosmetic skin whitening agent, is a slow-binding inhibitor of catecholase activity of tyrosinase. J Pharm Pharmacol 1994;46:982-5. Muizzuddin N, Shakoori AR, Marenus KD. Effect of antioxidants and free radical scavengers on protection of human skin against UVB, UVA and IR irradiation. Skin Res Technol 1999;5:260-5. Yoshimura K, Momosawa A, Aiba E, Sato K, Matsumoto D, Mitoma Y, et al. Clinical trial of bleaching treatment with 10% all-trans retinol gel. Dermatol Surg 2003;29:155-60. Kligman AM. The growing importance of topical retinoids in clinical dermatology: A retrospective and prospective analysis. J Am Acad Dermatol 1998;39 (2 Pt 3):S2-7. Hakozaki T, Minwalla L, Zhuang J, Chhoa M, Matsubara A, Miyamoto K, et al. The effect of niacinamide on reducing cutaneous pigmentation and suppression of melanosome transfer. Br J Dermatol 2002;147:20-31. Franchi J, Coutadeur MC, Marteau C, Mersel M, Kupferberg A. Depigmenting effects of calcium D-pantetheine-S-sulfonate on human melanocytes. Pigment Cell Res 2000;13:165-71. Ros JR, Rodríguez-López JN, García-Cánovas F. Effect of L-ascorbic acid on the monophenolase activity of tyrosinase. Biochem J 1993;295 (Pt 1):309-12. Burke KE, Clive J, Combs GF Jr, Commisso J, Keen CL, Nakamura RM. Effects of topical and oral vitamin E on pigmentation and skin cancer induced by ultraviolet irradiation in Skh: 2 hairless mice. Nutr Cancer 2000;38:87-97. Kiken DA, Cohen DE. Contact dermatitis to botanical extracts. Am J Contact Dermat 2002;13:148-52. Shastri Kashinath. Chaturvedi Gorakhnath. Charak Samhita. Vol. 1, 4. Varanasi: Chaukhambha Bharti Academy; 2007. p. 78. Sharma Anantram. Susruta Samhita. Vol. 1:38. Varanasi: Chaukhambha Surbharti Prakashan; 2009. p. 296. Sharma Anantram. Susruta Samhita. Vol. 1:38. Varanasi: Chaukhambha Surbharti Prakashan; 2009. p. 298. Shastri Ambikadatt. Bhaishjaya Ratnavali. Vol. 55. Varanasi: Chaukhambha Sanskrit Sansthan; 2005. p. 917. Shastri Ambikadatt. Bhaishjaya Ratnavali. Vol. 27. Varanasi: Chaukhambha Sanskrit Sansthan; 2005. p. 591. Shastri Ambikadatt. Bhaishjaya Ratnavali. Vol. 14. Varanasi: Chaukhambha Sanskrit Sansthan; 2005. p. 437. Shastri Ambikadatt. Bhaishjaya Ratnavali. Vol. 60. Varanasi: Chaukhambha Sanskrit Sansthan; 2005. p. 957. Tripathi Indradev. Gada Nigrah. Vol. 1, 6. Varanasi: Chaukhambha Sanskrit Sansthan; 2003. p. 360. Mishra BB. TLC-bioautographic evaluation of in vitro anti-tyrosinase and anti-cholinesterase potentials of sandalwood oil. J Food Sci 2011;76:C318-23. Burdock GA, Carabin IG. Safety assessment of sandalwood oil (Santalum album L.). Nat Prod Commun 2014;9:185-8. Available from: http://www.konarkindex.com/index.php/mulethi. [Last accessed on 2014 Mar 02]. 10 Health Benefits of Mulethi or Liquorice. Available from: http ://www.thehealthsite.com/./top. [Last accessed on 2014 Apr 18]. Available from: http ://www.herbs-treat and taste.blogspot.in. [Last accessed on 2014 Feb 20]. Vaibhav S, Lakshaman K. Tyrosinase enzyme inhibitory activity of selected Indian herbs. Int J Res Pharm Biomed Sci 2012;3:977-82. Prabhajit K, Bikram S, Subodh K, Satwinderjeet K.In vitro evaluation on free radical scavenging activity of Rubia cordifolia. J Chin Clin Med 2008;3:5. Herbtime. Available from: http://www.wordpress.com/2010/02/08/manjishtha-rubiacordifolia. [Last accessed on 2014 Feb 25]. Kumar VP, Chauhan NS, Padh H, Rajani M. Search for antibacterial and antifungal agents from selected Indian medicinal plants. J Ethnopharmacol 2006;107:182-8. Chow YL, Quon HH. Chemical constituents of the heartwood of Mesua ferrea. Phytochemistry 1968;7:1871. Bandaranayake WM, Selliah SS, Sultanbawa MU, Games DE. Xanthones and 4-phenylcoumarins of Mesua thwaitesii. Phytochemistry 1975;14:265. Raju MS, Srimannarayana G, Rao NV, Bala KR, Seshadri TS. Structure of Mesuaferrone-B a new biflavanone from the stamens of Mesua ferrea Linn. Tetrahedron Lett 1976;49:4509. Jayanthi G, Kamalraj S, Karthikeyan K, Muthumary J. Antimicrobial and antioxidant activity of the endophytic fungus Phomopsis sp. GJJM07 isolated from Mesua ferrea. Int J Curr Sci 2011;1:85-90. Sapkota K, Park SE, Kim JE, Kim S, Choi HS, Chun HS, et al. Antioxidant and antimelanogenic properties of chestnut flower extract. J Nat Med 2012;66:166-76. Chunekar KC, Nighantu B. India Materia Medica. Vol. 2. Varanasi: Chaukhambha Bharti Academy; 2013. p. 193. Jangwan JS, Bahuguna RP. Puddumin-B, a new flavanone glycoside from Prunus cerasoides. Informa Healthc Pharm Biol 1989;27:223-6. Murata K, Takahashi K, Nakamura H, Itoh K, Matsuda H. Search for skin-whitening agent from Prunus plants and the molecular targets in melanogenesis pathway of active compounds. Nat Prod Commun 2014;9:185-8. Austin A. A review of Indian Sarasaparilla, Hemidesmus indicus (L.) R. Br. J Biol Sci 2008;8:1-12. Pioneerherbs, 2005. Available from: http://www.pioneerherbs.com/hemidesmus_indicus.htm. [Last viewed on 2005 Jan 15]. Ravishankara MN, Shrivastava N, Padh H, Rajani M. Evaluation of antioxidant properties of root bark of Hemidesmus indicus R. Br. (Anantmul). Phytomedicine 2002;9:153-60. Kundu A, Mitra A. Evaluating tyrosinase (monophenolase) inhibitory activity from fragrant roots of Hemidesmus indicus for potent use in herbal products. Ind Crops Prod 2014;52:394-9. Singh G, Singh BS, Kumar BR. Antimicrobial activity of essential oils against keratinophilic fungi. Indian Drugs 1978;16:43-5. Thakur RS, Puri HS, Akhtar H. Major Medicinal Plants of India. Lucknow, India: CIMAP; 1989. p. 521-7. Peng HY, Lai CC, Lin CC, Chou ST. Effect of Vetiveria zizanioides essential oil on melanogenesis in melanoma cells: Downregulation of tyrosinase expression and suppression of oxidative stress. ScientificWorldJournal 2014;2014:213013. Kumar GS, Jayaveera KN, Kumar CK, Sanjay UP, Swamy BM, Kumar DV. Antimicrobial effect of Indian medicinal plants against acne-producing bacteria. Trop J Pharm Res 2007;6:717-23. Indradev T, Nighantu R. Chandanadi Varga-116. Varanasi: Chaukhambha Krishandas Academy; 2006. p. 419. Shirota S, Miyazaki K, Aiyama R, Ichioka M, Yokokura T. Tyrosinase inhibitors from crude drugs. Biol Pharm Bull 1994;17:266-9. Sharma PV. Dravyaguna Vigyan. Vol. 2. Varanasi: Chaukhambha Bharti Academy; 2006. p. 250. Marongiu B, Piras A, Porcedda S, Tuveri E, Sanjust E, Meli M, et al. Supercritical CO2 extract of Cinnamomum zeylanicum: Chemical characterization and antityrosinase activity. J Agric Food Chem 2007;55:10022-7. Chou ST, Chang WL, Chang CT, Hsu SL, Lin YC, Shih Y. Cinnamomum cassia essential oil inhibits a-MSH-induced melanin production and oxidative stress in murine B16 melanoma cells. Int J Mol Sci 2013;14:19186-201. Geng S, Cui Z, Huang X, Chen Y, Xu D, Xiong P. Variations in essential oil yield and composition during Cinnamomum cassia bark growth. Ind Crops Prod 2011;33:248-52. Mukherjee PK, Badami S, Wahile AM, Rajan S, Suresh B. Evaluation of tyrosinase inhibitory activity of some Indian spices. J Nat Remedies 2001;1:125-9. Indradev T, Nighantu R. Chandanadi Varga-41. Varanasi: Chaukhambha Krishandas Academy; 2006. p. 403. Moshiri M, Vahabzadeh M, Hosseinzadeh H. Clinical applications of saffron (Crocus sativus) and its constituents: A review. Am J Clin Dermatol 2008;9:15-31. Abdullaev FI. Cancer chemopreventive and tumoricidal properties of saffron (Crocus sativus L.). Exp Biol Med (Maywood) 2002;227:20-5. Bhat JV, Broker R. Riboflavine and thiamine contents of saffron, Crocus sativus Linn. Nature 1953;172:544. Sariri R, Sabbaghzadeh R, Poumohamad F. In-vitro antioxidant and anti-tyrosinase activity of methanol extracts from Crocus sativus flowers. Pharmacologyonline 2011;3:1-11. Galvano F, La Fauci L, Lazzarino G, Fogliano V, Ritieni A, Ciappellano S, et al. Cyanidins: Metabolism and biological properties. J Nutr Biochem 2004;15:2-11. Kubo I, Kinst-Hori I. Flavonols from saffron flower: Tyrosinase inhibitory activity and inhibition mechanism. J Agric Food Chem 1999;47:4121-5. Saraf S, Jeswani G, Kaur CD, Shailendra S. Development of novel herbal cosmetic cream with Curcuma longa extract loaded transfersomes for antiwrinkle effect. Afr J Pharm Pharmacol 2011;5:1054-62. Nguyen TA, Friedman AJ. Curcumin: A novel treatment for skin-related disorders. J Drugs Dermatol 2013;12:1131-7. Lee JH, Jang JY, Park C, Kim BW, Choi YH, Choi BT. Curcumin suppresses alpha-melanocyte stimulating hormone-stimulated melanogenesis in B16F10 cells. Int J Mol Med 2010;26:101-6. Chunekar KC, Nighantu B. India Materia Medica. Vol. 1. Varanasi: Chaukhambha Bharti Academy; 2013. p. 115. Saied S, Batool S, Naz S. Phytochemical studies of bereberis aristata. J Basic Appl Sci 2007;3:1-4. Blasko G. Karachine, an unusual protoberberine alkaloid. J Am Chem Soc 1932;104:2039-41. Blasko G, Sharma M. Taxilamine: A pseudobenzylpyroquinoline alkaloid. Heterocycle 1982;19:257-9. Chakarvarti KK, Dhar DC, Siddhiqui S. Alkaloidal constituent of bark of berberis aristata. J Sci Ind Res 1950;9b: 161-4. Singh J, Kakkar P. Antihyperglycemic and antioxidant effect of Berberis aristata root extract and its role in regulating carbohydrate metabolism in diabetic rats. J Ethnopharmacol 2009;123:22-6. Chunekar KC, Nighantu B. India Materia Medica. Vol. 2. Varanasi: Chaukhambha Bharti Academy; 2013. p. 232. Bickford PC, Gould T, Briederick L, Chadman K, Pollock A, Young D, et al. Antioxidant-rich diets improve cerebellar physiology and motor learning in aged rats. Brain Res 2000;866:211-7. Lee SE, Ju EM, Kim JH. Free radical scavenging and antioxidant enzyme fortifying activities of extracts from Smilax china root. Exp Mol Med 2001;33:263-8.
van Acker SA, van den Berg DJ, Tromp MN, Griffioen DH, van Bennekom WP, van der Vijgh WJ, et al. Structural aspects of antioxidant activity of flavonoids. Free Radic Biol Med 1996;20:331-42. Joshi SG. Medicinal Plants. Calcutta: Oxford and IBH Publishing; 2000. p. 170. Nagulendran KR, Velavan S, Mahesh R, Hazeena Begum V.In vitro antioxidant activity and total polyphenolic content of Cyperus rotundus rhizomes. E J Chem 2007;4:440-9. Indradev T, Nighantu R. Prabhadradi Varga-10. Varanasi: Chaukhambha Krishandas Academy; 2006. p. 265. Bindurani R, Kumar K. Evaluation of antioxidant activity of hydro distilled extracts of leaf, heart wood and flower of Azadirachta indica. Int J Pharm Sci Rev Res 2013;20:222. Kashinath S, Gorakhnath C. Charak Samhita. Vol. 1, 25. Varanasi: Chaukhambha Bharti Academy; 2007. p. 468. Naik GH, Priyadarsini KI, Satav JG, Banavalikar MM, Sohoni DP, Biyani MK, et al. Comparative antioxidant activity of individual herbal components used in Ayurvedic medicine. Phytochemistry 2003;63:97-104. Tarwadi K, Agte V. Antioxidant and micronutrient potential of common fruits available in the Indian subcontinent. Int J Food Sci Nutr 2007;58:341-9. EMBLIC MYROBALANS: AMLA Key Herb of Ayurvedic Medicine by Subhuti Dharmananda, Ph.D., Director, Institute for Traditional Medicine, Portland, Oregon. Available from: http://www.itmonline. org/arts/amla.htm. Bhattacharya A, Chatterjee A, Ghosal S, Bhattacharya SK. Antioxidant activity of active tannoid principles of Emblica officinalis (amla). Indian J Exp Biol 1999;37:676-80. Sripanidkulchai B, Junlatat J. Bioactivities of alcohol based extracts of Phyllanthus emblica branches: Antioxidation, antimelanogenesis and anti-inflammation. J Nat Med 2014;68:615-22. Manosroi A, Jantrawut P, Ogihara E, Yamamoto A, Fukatsu M, Yasukawa K, et al. Biological activities of phenolic compounds and triterpenoids from the galls of Terminalia chebula. Chem Biodivers 2013;10:1448-63. Huang HC, Chiu SH, Chang TM. Inhibitory effect of -gingerol on melanogenesis in B16F10 melanoma cells and a possible mechanism of action. Biosci Biotechnol Biochem 2011;75:1067-72. Kashiwada Y, Aoshima A, Ikeshiro Y, Chen YP, Furukawa H, Itoigawa M, et al. Anti-HIV benzylisoquinoline alkaloids and flavonoids from the leaves of Nelumbo nucifera, and structure-activity correlations with related alkaloids. Bioorg Med Chem 2005;13:443-8. 4 Antifungal and Anticancer Potential of Argemone mexicana L.